Mary Magdalene: It’s helpful to learn about the merkaba. Your energy body is there to help you and the merkaba is, in some ways, the completion of this stage of learning of what your energy body is, what it can do, and how it can help you. The merkaba is here to help you in a couple of primary ways. One is it’s very much for your protection. It acts much the way a crystal acts, only it’s not the physical form of a crystal. Many of you have heard from various sources that as you progress in your spiritual development and move into the higher dimensions, you are going to change from carbon-based beings to crystalline-based beings. Your merkaba is part of this. It acts in many ways like a crystal. It also acts differently than a physical crystal, so there are also differences. It’s energetic; it’s not physically based. But it has some of the qualities and capabilities of crystals. One of the things that crystals do is they can protect you. They are very powerful forms of protection, if you know how to use them. Your merkaba is the same. You can use it for energetic protection. This is something that many of you would be benefitted by. 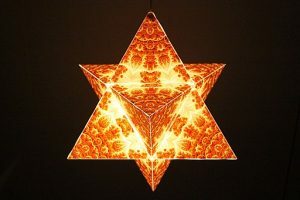 So that is one of the reasons it’s important to learn about the merkaba—so you can have full access to its protection, which will support you energetically. Another reason is that your merkaba is an activation device, which is also similar to a crystal. Crystals are used right now by your scientific world in many of your technological advances, such as the computer world. What you call your high-tech industry is often based on crystals because crystals can activate high-level processes. When you activate your merkaba, its crystalline nature is going to be very supportive for you in being able to manifest much more directly, easefully, and effectively. Now this can bring up fear for some people. Some people have fear that that’s too much power and “who knows how I’m going to use that.” Perhaps they have memory of a past-life where they misused power or perhaps they just don’t trust that they have the wisdom to know how to use power. Those are healthy fears. However, I want to remind everyone that you are already manifesting. You are simply doing it in a more primitive way at the third dimension. But all of you are manifesting all the time. So when you access the fourth dimension, it’s simply that your manifestation will happen more directly and more quickly. You already have experience with making choices around what you choose to manifest. It is very wise, very sagacious, to realize that yes, there are ramifications to your manifestation. It is important that you use that power for the highest good, for yourself and all. This is why this power is not given at the third dimension. It is given at the fourth dimension, especially after beings have done your emotional work. This is another reason for doing your emotional work. That is a safeguard. Your emotions are very powerful protectors. If you are not engaging for the highest good, you will get feedback through your emotions. It will be very painful for you. And conversely, if you are manifesting for the highest good, your emotions will also give you feedback of joy, balance, wholeness, ease, contentment, peace, all of those kinds of things. You actually have a lot of skills already developed that are safeguards against you misusing power. This is not to say that you can’t misuse power. But it is much less likely if you have the ability to go into your heart. This is why it is important that you are a heart-and-mind integrated being, rather than simply a being acting from the mind, dissociated from the heart. The merkaba will help you to manifest in integration with your heart. And your heart will participate and steer you. To those of you who feel afraid of having more power, I hope this is reassuring. Your world actually needs the people who are connected to their heart to take power. Your world is tremendously imbalanced by people assuming power who are not connected to their heart. It is a responsibility to engage your power but it does not have to be a heavy responsibility. If you do the work of staying connected to your heart, then your power will be a natural ability, in balance and in integration with your heart. I am so sorry to hear about your accident. I don’t have Facebook -no time to social networks. My prayers will be with you; and I wish it is sort of muscle strain with no consequences. Please take care. Not only do we (people following Mary Magdalene) need you, but Mankind as well to go on with his marvelous job. Again a beautiful supportive message, thank you! As I’m familiar with the MerKaBa activation since 1996, feeling a strong connection to the teachings of ancient Egypt as well, I’ve found many different teachings for this activation. The one that is genuine, directly coming from source, is the Flower of Life MerKaBa instruction. They can be found on YouTube, under the name Drunvalo Melchizedek Flower of LIfe, and in the 2 Volumes of the book “The Ancient Secret of the Flower of Life” present on scribd.com as free pdf downloads. Including the illustrations. Apart from the MerKaBa activation procedure, with the assistence of Thoth, these books offer insight in the laws of creation, based on geometry and the wedding of the divine feminine and masculine energy, on a human level and cosmic level. Including Christ Consciousness. Hello Marian, I’m glad you enjoyed the message. I’m familiar with Drunvalo Melchizedek’s teachings, as I went through his teacher training program for his newer way of activating the merkaba. I agree that his is a genuine approach, but I didn’t find it sufficient enough for most people to be able to accomplish and sustain. So I developed my yearlong program of the ASCENSION SCHOOL ONLINE PROGRAM, which integrates his teaching with other practices, and gives people the full time and foundation they need for to be able to accomplish and sustain this shift. I have found this to be very successful to activate the merkaba and access the fourth dimension, which gives me great joy. 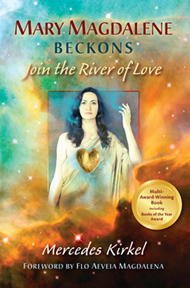 To learn more, go to http://mercedeskirkel.com/ascension-school-online-course/. Thank you, Mercedes. I’m happy to learn that this connection between your and Drunvalo’s work exists. Fortunately, we’re living in a time where manifesting creations of miracles and power, by activation of our higher parts for the good of all, has found far more fertile soil, even a craving is present it seems, compared to the Dark Ages, when people were shunned and punished for using their spiritual skills. To me it’s quite an adventure to live and be the changer and the changed both. It seems to require a strong foundation of trust and a vigilant fluidity of attitude. Wishing you a good recovery, healing from the car-bump!